****ALERT: Milling and Paving on upper Washington St. starting tomorrow (4/15). Click HERE for the notice just sent from the City about diverted 22, 89 and 126 buses. Warning... I think the instructions aren't quite correct... and I have informed the City. But you can get the gist with this, just be on the look out for a corrected one. You can tune in online HERE (click on the April 15th date) or on FB Live. Please tune in or better yet, attend in person and participate in the hearing! If you are someone who has raised questions or concerns about how we plan to manage development, affordable housing, rent control or our recreation and senior programs, then this is the hearing for you! If you are someone who wants to know HOW MUCH DOES HOBOKEN MAKE FROM PARKING METERS and other types of permit fees and what we do with these revenues, then this hearing is for you! Restating what I said previously: As Chair of the Finance and Infrastructure subcommittee, I will be presiding over the hearings. The budget that has been proposed by the mayor has an almost 3% tax increase and includes depleting our surplus. 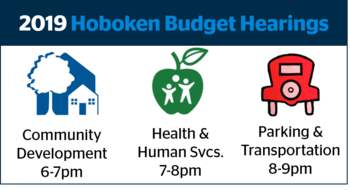 Our job now is to determine if there is any further opportunity for us to reduce the burden on taxpayers, yet still support the necessary services to improve (or at least maintain) the quality of life of our residents. Please join or watch this important hearing! As always please forward this to anyone you think may be interested in this. And feel free to reach out via email, text or phone (201-208-1674) about this or anything else important to you.